In the second of a series of articles for Builders’ Merchants News we focus on Lawsons’ approach towards recruiting, retaining, and developing its people. As we enter 2019, the skills shortage is still one of the biggest challenges faced by the construction industry and more needs to be done to attract new blood into the sector. Nationwide campaigns such as ‘Build a Career Without Limits’ have an important role to play in educating young people and career switchers, but it’s vital they are backed up with real opportunities. 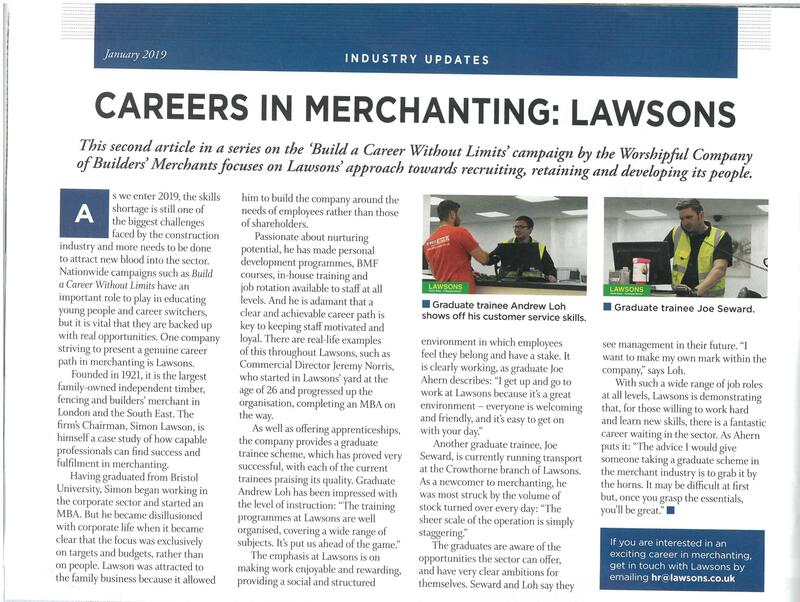 One company striving to present a genuine career path in merchanting is Lawsons. Founded in 1921, it is the largest family-owned independent timber, fencing and builders’ merchant in London and the South East. The firm’s Chairman, Simon Lawson, is himself a case study of how capable professionals can find success and fulfilment in merchanting. Having graduated from Bristol University, Simon began working in the corporate sector and started an MBA. But he became disillusioned with corporate life when it became clear the focus was exclusively on targets and budgets, rather than on people. Lawson was attracted to the family business because it allowed him to build the company around the needs of employees rather than those of shareholders. Passionate about nurturing potential, he has made personal development programmes, BMF courses, in-house training, and job rotation available to staff at all levels. And Lawson is adamant that a clear and achievable career path is key to keeping staff motivated and loyal. There are real life examples of this throughout Lawsons, such as Commercial Director Jeremy Norris, who started in Lawsons’ yard at the age of 26 and progressed up the organisation, completing an MBA on the way. Another graduate trainee, Joe Seward, has been running transport at the Crowthorne branch of Lawsons. As a newcomer to merchanting, he was most struck by the volume of stock turned over every day: “The sheer scale of the operation is simply staggering,” he says. The graduates are aware of the opportunities the sector can offer, and have very clear ambitions for themselves. Seward and Loh say they see management in their future. “I want to make my own mark within the company,” says Loh. Seward is now Assistant Branch Manager. Also watch Lawson’ video on its graduate trainee programme below. Read about past WCoBM news and events. The WCoBM plays a key part in the builders’ merchant sector, promoting training and education for builders’ merchants and fundraising for a number of charities. It is also very active in supporting the Mayoralty and raising the profile of builders’ merchants in the City, while highlighting their importance in ‘Supplying Britain’s Building Needs’.